Fujitsu Laboratories Ltd. today announced that it has expanded its Creative Digital Space User-Interface (UI) technology(1) , developed in 2015, which turns entire rooms into digital space, and has developed technology that smooths co-creation activities across multiple locations. Previous Creative Digital Space technology has streamlined the sharing of information amongst numerous people by enabling collaboration through connecting multiple large screens and other devices in a single location. When sharing data between multiple locations, however, the data is mainly stored in the cloud and not accessible concurrently. For this reason, with co-creation activities that require repeated exchanges of ideas and edits to the data, factors such as only one user at a time being able to access, external network lag and others impact the user experience, making smooth communication impossible. Now, Fujitsu Laboratories has developed a distributed data sharing technology which stores data locally at each location, not in the cloud. Depending on network latency between each location, this technology only synchronizes necessary differences in data, while eliminating unnecessary data, such as trajectory data when content is moved, providing smooth data usage across multiple locations. Additionally, Fujitsu Laboratories has developed an awareness propagation technology to enable remote users to know if something is being added or changed in another location to help avoid the conflicting operations that can happen when data is freely accessed from any point, improving the efficiency of co-creation activities across multiple locations. With these technologies, users on the manufacturing front lines, for example, can connect with their colleagues in design locations and even overseas manufacturing bases, enabling the rapid resolution of problems through the quick sharing of data, and thereby creating a more expansive world where co-creation space can expand via networks or the internet. In recent years, with the spread of smart devices and the further development of cloud and communication technologies, it has become possible to share issues that arise in manufacturing sites or other settings through device screens, even between remote locations. This is currently limited to text and image data, however, and holding discussions with large numbers of people using a screen to share data can prove difficult. The Creative Digital Space UI technology, developed by Fujitsu Laboratories in 2015, enables collaboration by linking multiple large screens and devices in one location, making it possible to efficiently share data with large numbers of people. 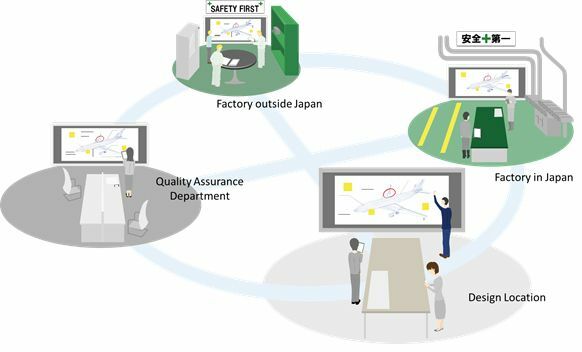 In the field of manufacturing, the concept of a virtualized project room offers a way to quickly and efficiently share issues on the ground and find solutions by connecting different places, including design facilities, manufacturing facilities, both inside and outside Japan, and quality assurance departments (Figure 1). Fujitsu Laboratories has developed technology to expand its Creative Digital Space UI technology across multiple locations and make this concept a reality. Technologies currently exist for sharing data between different points, including linking remote locations with video and PC screen sharing, but only one location can operate the PC at once. There are also coordination technologies that allow documents in the cloud to be simultaneously edited from multiple locations, but the user experience of the system at hand can be impacted by external network lag. It has been difficult to develop technologies that support smooth sharing and use of the same data, both within a single location and between locations, as part of co-creation activities that require repeated exchanges of views and editing of data. Also, realizing technologies that do not lead to reductions in work efficiency even in situations where it is possible to access data freely from any location and therefore operational conflict occurs as multiple users attempt to interact with the data, has proven to be a challenge. Fujitsu Laboratories has now developed network technology that does not impact the user experience of a system, even when sharing the same data across multiple locations, and a user interface technology that reduces operational conflicts. Features of these newly developed technologies are as follows. Fujitsu Laboratories developed a distributed data sharing technology that stores on-screen movement and application data locally at each point of access, not in the cloud, and synchronizes only the necessary data for smooth operations and sharing (Figure 2). User activities in applications can be shared smoothly in real time with displays and devices in the same location between users. When sharing data with other locations, this technology offers efficient communications by leaving out unnecessary data, such as the path of something as it is moved around a screen, depending on network latency between each location. An internal field trial of this technology showed that it reduced delays in sharing data by about 90% over conditions before applying this technology, synchronizing data with a maximum of 2.1 seconds with three locations, and a maximum of 3.1 seconds with six locations, while also maintaining local data sharing at a specified level (less than 0.3 seconds), even when the number of locations increased. This meant that Fujitsu Laboratories was able to confirm the effectiveness of this technology in preventing the number of connections to other locations from affecting local response, with synchronization times fast enough to not disrupt local collaboration. 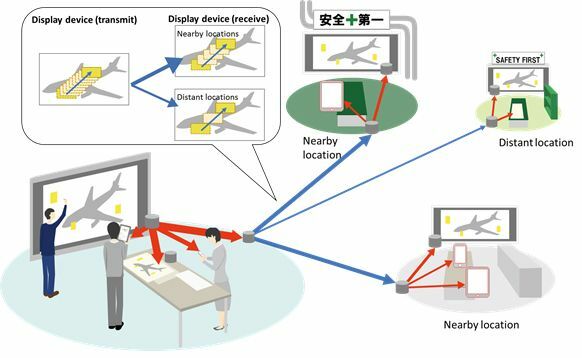 In response to the problem of conflicting operations, Fujitsu Laboratories developed an awareness propagation technology that lets users understand what remote users are doing (Figure 3). The technology notifies users what is happening at remote locations in a variety of ways, like making objects they are interacting with flash, and displaying a shadow representing the other user's position. This allows users to notice when other users are in the process of adding or changing content so that they do not interfere with the process, reducing conflicts in operation. Fujitsu Laboratories conducted internal testing using this technology involving a task of sorting photographs and handwritten notes jointly between two locations, and effectively confirmed that this technology was able to limit operational conflicts to 50% less than without using this technology (22 conflicts without this technology, 11 with), improving work efficiency by approximately 26% (the task required 329 operations without this technology, 241 with). With these technologies, Fujitsu Laboratories was able to create a system that offers smooth, simultaneous use while limiting conflicting operations, enabling collaboration between multiple locations using multiple large screens. This not only allows for faster issue sharing and decision-making in manufacturing, for example, but also transformations in the way people work, such as in generating ideas in ordinary offices without gathering everyone together. Additionally, in educational contexts these technologies can create new styles of lessons, such as remote active learning through exchanges between schools. Fujitsu Laboratories will deploy these technologies internally, conducting further field trials of their effectiveness in supporting idea generation, with the goal of commercializing them in fiscal 2018. Through these field trials, Fujitsu Laboratories will promote initiatives aimed at transforming ways of working and supporting knowledge creation with ICT.